ProjekTraum l’atelier Glidden Wozniak is proud to present the drawings of sculptor Jack Henry. 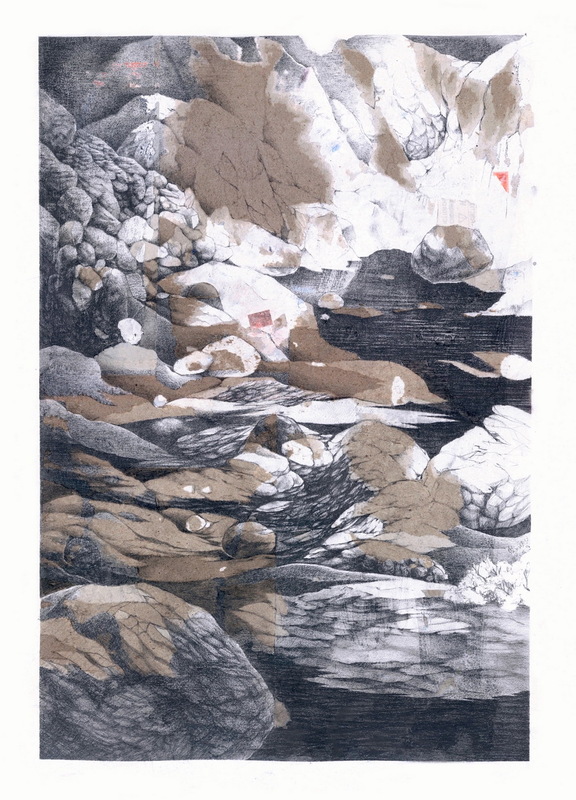 Terraforms is a series of recent graphite drawings whereby the landscape reveals itself to Henry as he responds to the chaotic remnants of an initial collage process of gluing and tearing the paper away. His methods are similar to his approach to sculpture where he builds geometric forms composed of detritus from the streets of Brooklyn. Jack Henry will talk about his work at the opening reception on June 30 at 19:00. This is Jack Henry’s first solo exhibition in Europe. Jack Henry was born in 1984 in Jackson, MS, USA and raised in the suburbs of Flint, Michigan. He received his BFA from Florida Atlantic University, Boca Raton and his MFA from University of Maryland, College Park with a concentration in sculpture/installation. His work has been shown throughout the US including recent shows at Lesley Heller Workspace, New York; Black and White Gallery, Brooklyn; Storefront Bushwick, Brooklyn; Dodge Gallery, New York; Nudashank, Baltimore; Fjord Gallery, Philadelphia; Space Gallery, Portland ME; Glass Curtain Gallery, Columbia College, Chicago; La Esquina Gallery, Kansas City; Kunsthalle Galapagos, Brooklyn; Ground Floor Gallery, Brooklyn; Castle Gallery, College of New Rochelle, New York; Radiator Gallery, Long Island City. His work has been written about in the Chicago Tribune, the L Magazine, Hyperallergic, Beautiful/Decay, ArtFCity, New American Paintings, Philadelphiaweekly.com. Jack Henry has lived and worked in Brooklyn, NY since 2010. This exhibition is the first in a series of three consecutive shows of American artists in ProjekTraum FN this summer. The artists will be in attendance. Works from this exhibition are now available to buy through the website. Artist statement and installation views are here.